Dr. Gary Kremer, Executive Director of the State Historical Society of Missouri, presented the following slideshow program on “Boone County Courthouses” to the BCBA on May 10, 2006. Note: Page 6 of the slideshow explains the phrase, “Oh! Justice, when expelled from other habitations, make this thy dwelling place” that appeared on a stone panel mounted on the second Boone County Courthouse completed in 1847. The phrase is attributed to William Jewell, who supervised the construction. The same stone panel now hangs in the entry foyer of the current courthouse. Columbia became the county seat of Boone County in 1821. The first courthouse was constructed seven years later in 1828. The 40-foot-square, two-story, brick courthouse with hipped roof featured a cupola-like structure at the apex. That courthouse was the first of three to be built in Columbia. The third and present courthouse was built in 1909, and its location was moved to the center of the square. Twenty-two architects visited with the court before the court commissioned John H. Felt to draw plans for the new building. The court requested that Felt design a building conforming to their wishes for a restrained classic design. J.A. McCarter from Macon, Missouri was the contractor, and the cost came to about $100,000. The front of the building has remained unchanged since the original construction. The north side of the building, however, has had several phases of updates. 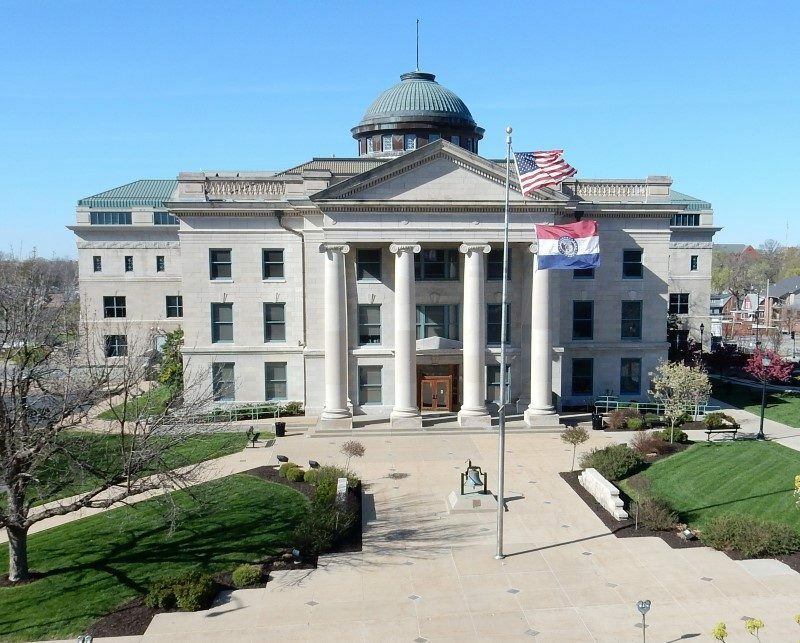 On May 2, 1992, a $7 million dollar addition and renovation was completed – including construction of a courthouse annex connected to the original courthouse via a glass walkway. In 2008, the courthouse was again expanded and renovated, adding two additional floors and a state-of-the-art technology courtroom.